Ever wonder what happens when you buy carbon offsets? This company Ecosecurities Group is one of the companies that creates a market in carbon offsets. Its founders, according to today’s Wall Street Journal, are multimillionaires. “Marc Stuart and Pedro Moura Costa have become multimillionaires in a booming new market designed to fight global warming.” (WSJ, 4/14/2008, “Two Carbon Market Millionaires Take a Hit as UN Clamps Down”). Last week the New York Times published a fascinating article about the Anasazi people of the 13th century and their move from the Colorado plateau south to where Arizona and New Mexico are now. Scientists and anthropologists have no simple explanation for why they moved. Apparently, climate change was only part of the explanation; religion may be another reason; wars might be part of the reasons as well. Andrew Revkin’s New York Times blog, Dot Earth, published a story about this animated CO2 map. Watch the purple blob demonstrate rising CO2 levels. Link to Breath of a Nation. A Reuters article today says that climate change is already causing health problems, including contributing to an outbreak of Rift Valley Fever. I spent the weekend in Las Vegas. I enjoy the heck out of Las Vegas, but… it really is a flaring example of profligate use of natural resources. Whenever I’m there I always see a dark vision of its potential future. 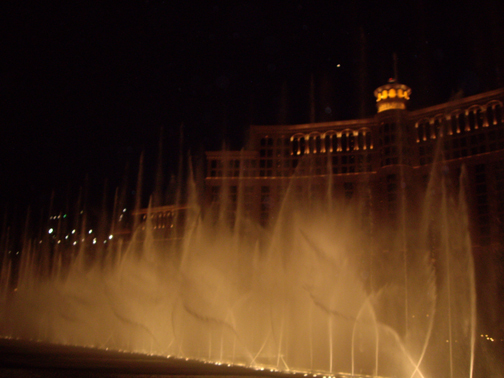 When I’m watching the amazing fountains at the Bellagio, I find myself thinking: “we’re in a desert and they’re wasting a LOT of water to evaporation.” And then I start thinking more. I see Las Vegas a hundred years from now, the luxury hotels still standing–but deserted, empty, no water, desperate people using them as apartments, trashing one and moving to the next, the gorgeous stone floors broken. The amazing fountains are empty and dry. The Wynn’s waterfalls dry and the concrete decaying. The golf courses are sand traps and dunes. This is the Desert Springs Preserve. A hundred years ago, this was a spring, with fresh water. It dried up–too many people taking water uphill from it–in the 1950s. 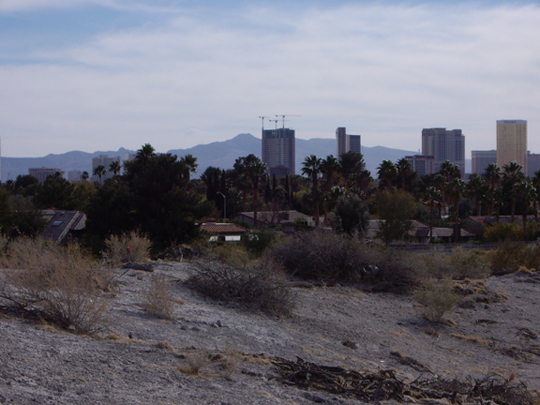 The city of Las Vegas grew up around the spring, around the source of fresh water, and now it’s a preserve, protected against future development, an oasis of true desert in the urban sprawl of Las Vegas. And a vision of the future.